It goes without mentioning that every SEO has their favorite techniques to implement and while interviewing candidates for the position of a search engine optimizer, it’s vital to know whether or not their strategies abide by yours. It is never possible to be in agreement all the time but the interviewers should offer you a basic comprehension of how the strategies of the candidate will cooperate with that of your business. It is essential to have a clear understanding of the experience and knowledge of a candidate but at the same time, experience and knowledge are gateways to the most vital thing, about what the search engine optimizer will do. The concerns of this article will tell you about the way in which your candidates will stack against each other and assist you in filtering out what is right and what is wrong for your company. #1: What are the few things which are vital to know about before working on a website? The 3 things that you ask about are not as important as the reason behind such things mattering to them. But this can offer you enough information on how the candidate assesses the needs of the website and the responsibilities which are there ahead. You will gradually understand the mindset of the prospective SEO. #2: What is the foremost thing to do while optimizing a site? The potential candidate will probably tell you that their answer depends on what they deduce about the website but don’t take this answer casually. There are indeed too many things that an SEO can do when he first thinks of optimizing a website. You should boost them so that they gradually articulate what those things are. #3: How do you differentiate between landing pages and optimized pages? Traditionally, we know that landing pages are for purposes of PPC and optimized ones are for SEO. But if the candidate is a really good and worthy SEO, he would consider every optimized page as a landing page. The candidate should outline what they perform in order to consider optimized pages as landing page. #4: How can you go about optimizing a website which has got several pages? 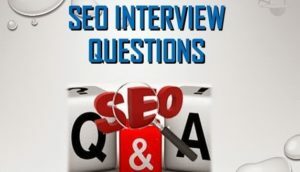 When you ask this question, your intention within is to get an answer where the candidate offers few large-scale SEO strategies and tactics. It is not that all aspects of SEO requires a long time but at the same time it is these strategies where even small websites can obtain better results in a much faster time. #5: How would you react when your first SEO attempt fails? The SEO should be aware of the reality that first attempts to optimize a website in a specific manner are rarely successful. Immediately, you will never get positive results. This is the answer that you should expect from a candidate. This should be followed by the optimizer not only when their initial attempts fail but also when their efforts don’t bring the desired results within the calculated time. #6: How are you armed to safeguard websites against sudden changes in algorithm? The overall philosophy of the prospective candidate will be easily uncovered after getting an answer. Every search engine optimizer will inform you that they perform SEO for long term but this is the time when you can push them into discussing few of the specific long-term tactics. Therefore, while hiring an SEO for your company, make sure you know every single detail about him and about the way he deals with SEO so that you can guarantee success for your company. A poorly judged SEO can spoil the reputation of your company.